The landscape of global health has shifted substantially over the past decade. Private actors, like the Gates and Clinton Foundations, make up a large and growing proportion of overall aid funding, even as the once-steady rise in government aid for diseases like HIV/AIDS has slowed sharply. Coming to terms with the new face of global health will mean addressing issues of accountability, efficiency and ownership, in order to accommodate the goals and motivations of public and private actors to the needs of aid recipients and disease-sufferers. As funding for global HIV/AIDS treatment becomes more constrained, two principles have been dominating discussions on the global response to the disease: sustainability and efficiency. A third, less talked-about principle, is also central: ownership. To realize these three principles, the donor community needs to change business as usual. Through their foundations and personal-diplomacy efforts, Bill Gates and Bill Clinton are changing how the international community addresses global health concerns. But the prominence of their two foundations raises a host of issues about the role of private actors in international governance, policy accountability within the international community and the ethical obligations for eliminating global health disparities. It has previously been an underlying assumption that support to health in poor countries basically amounts to supporting government-run health. 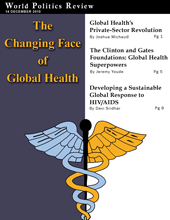 So, why is there now a surge in interest and activity in global health from the private side? Why has the private sector intruded and in some instances upended the traditional model of development assistance for health? Should we welcome and encourage a private-sector revolution in global health?